What is a SHAZAM Sublicense? A FREE downloadable full featured Single User License of SHAZAM. Any SHAZAM Site License holder. Who is eligible to have their own SHAZAM Sublicense? Any bona fide member of a Site License holder’s organization (e.g. employee, staff or student) can be given a full Single User Licensed copy of SHAZAM to install on their personal computer. Is there a limit on how many Sublicenses that can be created? Academic Site license holders may create an UNLIMITED number of Sublicenses for bona fide members of their organization. Government and Commercial Site License holders may create a number of Sublicenses equal to their Licensed User count to allow their SHAZAM users to use SHAZAM offsite. It is FREE. 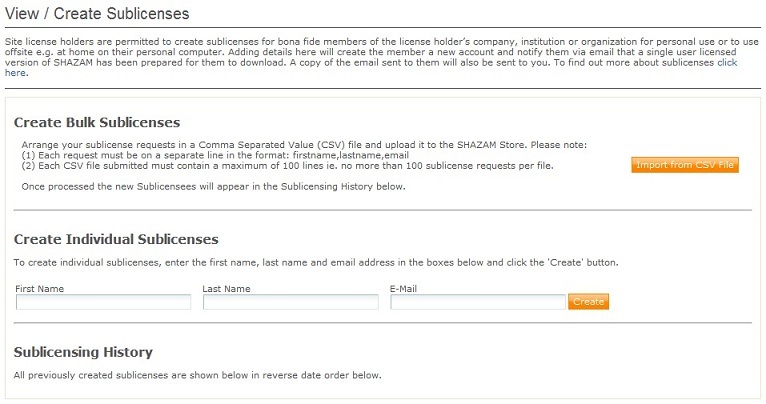 SHAZAM Sublicensing is included in the price of a SHAZAM Site License. What are the other benefits of Sublicensing? So how are Sublicenses created? Create Individual Sublicenses by entering the Licensees First Name, Last Name and Email address (as shown below). An email will be sent from the SHAZAM Store to each new licensee with instructions on what to do next and either a copy of that email or a summary will also be sent to you. Once logged in, s/he clicks Account and then can download the Sublicense from the Downloads page. Please Note: The individual’s name and the organization’s name will be clearly displayed within the Sublicensed SHAZAM software. How many License Requests can be uploaded in a single Comma Separated Value (CSV) File at one time? The limit is set currently at 100 which takes the server less than 10 seconds to process. If I upload a CSV file with 100 Sublicense Requests will I get 100 emails? No. You will be sent a single summary email with all new licensees login details as well as any error reports for any that have failed. Each of the 100 new licensees will get an email with their Account Login details. All emails are queued and sent within a few minutes of the upload being completed. We hold a Site License copy of SHAZAM and would like to use this Sublicensing facility but do not have a SHAZAM Store Account. What do we do? Please contact us citing your Site License number. I have a sublicensed copy of SHAZAM. When a new version of SHAZAM is released, can I upgrade my Single User License of SHAZAM too? Yes. Minor Upgrades e.g. 11.0 to 11.1, 11.2,... can be downloaded from your SHAZAM Account as soon as they are released. For major upgrades e.g. version 11 to version 12 then if your organization upgrades their Site License then they can grant you a new sublicense to the new major version. Such an upgrade remains at the discretion of the Site License holder.